Published: Sept. 23, 2018 at 02:02 p.m.
San Francisco 49ers quarterback Jimmy Garoppolo executes a play-action pass to perfection as he finds Kyle Juszczyk wide open for a 35-yard touchdown. Published: Dec. 24, 2017 at 05:24 p.m.
San Francisco 49ers quarterback Jimmy Garoppolo dials long distance to his fullback Kyle Juszczyk for 44 yards. 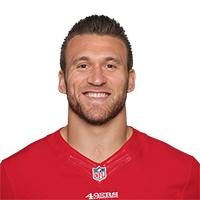 Published: Oct. 8, 2017 at 03:57 p.m.
San Francisco 49ers QB Brian Hoyer finds fullback Kyle Juszczyk for the 6-yard TD.